Preheat 15- or 16-inch Presto® Electric Skillet at 400°. Heat 2 teaspoons vegetable oil and 1 teaspoon sesame oil in skillet. Add chicken and stir-fry until chicken is cooked through, about 4 to 5 minutes. Remove chicken and keep warm. Reduce heat setting to 350°. Add remaining vegetable oil and sesame oil. Add onion and pepper; stir-fry 2 to 3 minutes. Add zucchini and mushrooms; stir-fry 1 to 2 minutes. Add ginger; stir-fry 15 to 30 seconds. Return chicken to skillet. Mix in stir-fry sauce and sesame seeds; cover and cook 1 minute. 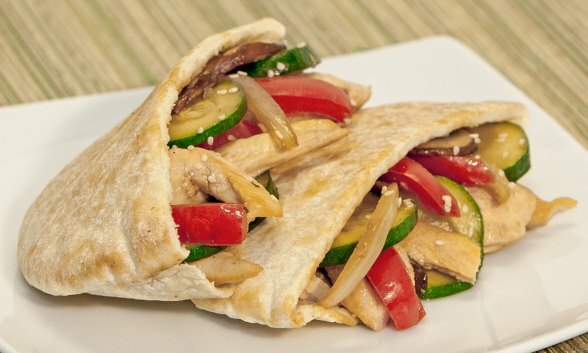 Cut each pita round in half. Fill equally with chicken vegetable mixture.